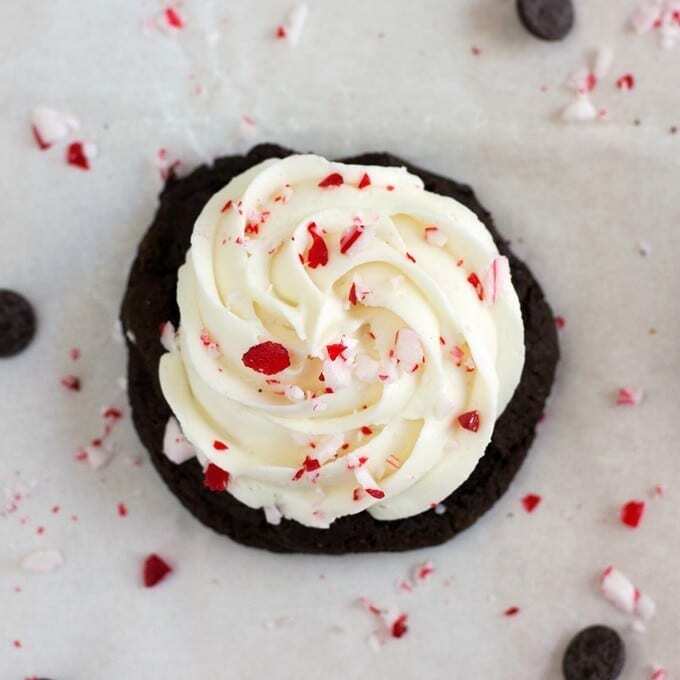 The buttercream frosting whips up in minutes and the infusion of peppermint extract makes it taste super refreshing and super easy to eat-too-much-of. I included a double batch so each little cookie can have a thick layer of frosting! 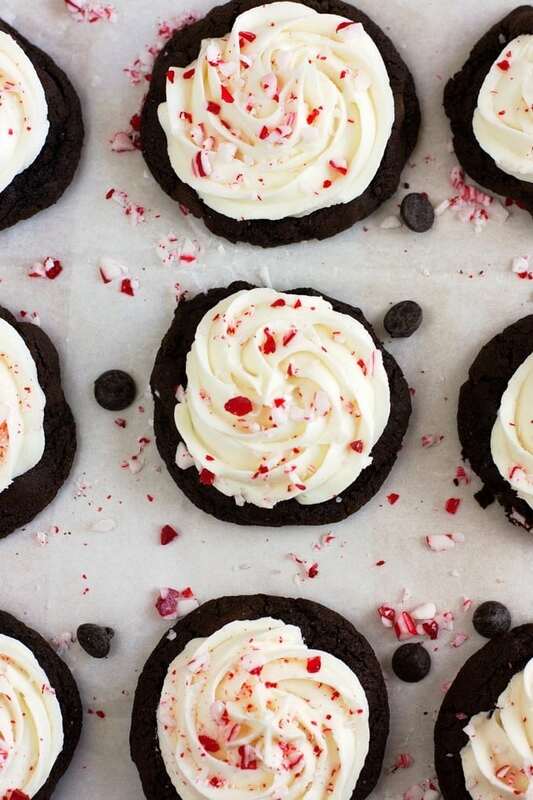 Make these cookies festive by topping them off with crushed candy canes! You can either crush the candy canes yourself, using a rolling pin and a Ziploc bag or buy the pre-crushed ones 🙂 Either way they will sparkle with Christmas candy-cane cheer! Sift together flour, cocoa powder, baking soda, and salt. Set aside. In a large bowl use a stand mixer or electric handheld mixer to cream butter on medium speed, about 1 minute. Add white and brown sugar and continue to cream until light and fluffy. Beat in egg until blended. Add peppermint and vanilla extract. With the mixer on low, gradually stir in dry ingredients until just combined. Stir in milk and chocolate chips. Let dough chill for at least 30 minutes in frig. Once dough is chilled, preheat oven to 350 degrees F. Form dough balls with about 2 tablespoons of batter. Arrange on cookie sheet with about 2 inches between each cookie. Bake until edges of cookies are just set, middle will still be a little undercooked, about 10 minutes. Let rest on cookie sheet for 5 minutes, then cool completely on a wire rack. Once cookies are cool, prepare the frosting. Beat softened butter on medium speed with a stand mixer or electric mixer until smooth and creamy, about 3 minutes. Add powdered sugar, vanilla extract, peppermint extract, and a pinch of salt and beat on high until frosting is fluffy, about 1-3 minutes, scraping down sides when necessary. 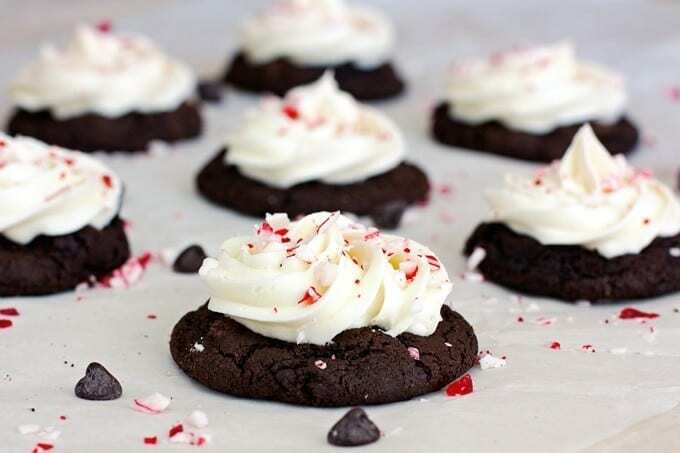 Once frosting has reached desired consistency add more peppermint extract and/or salt to taste if necessary. Frost cookies, either with by piping on with a frosting bag or spreading on with a knife. Sprinkle with crushed candy canes and serve! Wow, these cookies are perfect for Christmas!